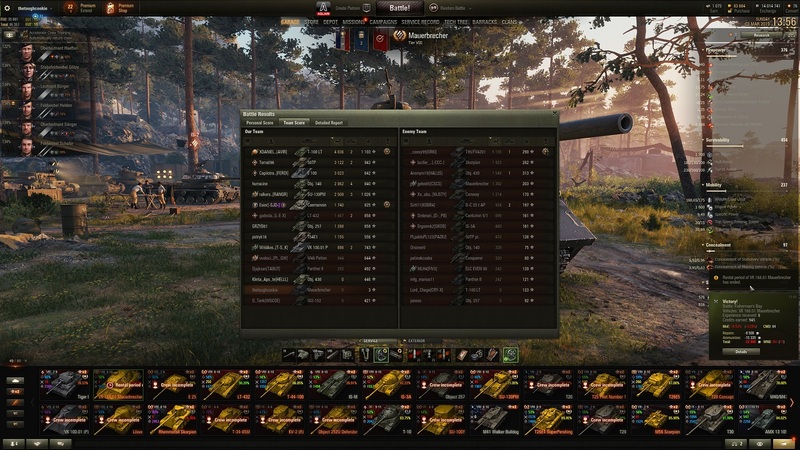 What a great tank, I knew it was bad, but this is _horrible_. I hope no-one will never make mistake and ever buy that. Gaming experience totally perfect with that tank, if the main goal is only to lose nerves with it. Why to make tank like this? Tech tree one is great, but this is totally waste of space in game. If it would be russian, it would have been buffed already. Thanks for 10 games of pure crapWG, you should enable option if you want to use rental or not. My suggestion for this tank quickly thought is: increase speed to bit, to 22-24km/h. Or make tank even tiny bit better else way. If this tank is superheavy, it should be it then even from some point, and I dont mean only speed. If you knew it was bad, why did you buy it? He didn't I don't think, there is a mission at the moment that gives you a 10 game rental for it. It's an ok tank.. It's just horrible to play and boring since it's too slow. Still you can trade 440 shots and you have HP and enough armor to bounce some shots. The only difference is you have weakspots so higher tier meds don't have to load goal for your cupola. How about you play more than 1 battle in it before throwing out DPG numbers eh? No, I will never play it again. Shock horror. WG reverts to the old SerB rule of premium tanks not being as good as the elite tech tree equivalent. Someone renting a Mauerbrecher complains it is not as good as an elite tech tree VK100.01(P). For most of us this is excellent news. Premium tanks should be worse than the tech tree equivalent. The Object 252U/Defender was wrong and a huge gameplay error. It would appear with the Mauerbrecher WG have at least learnt that lesson. So you expect people to pay money and play tanks that are inferior to the ones you get for free? For what exactly? Why would you buy more than one premium tank then? That could be true. As a noob tanker, I get 61% winrate in VK100 which is way higher than my avarage winrate in any heavy tank. Except for 112 but that tank also has noobie proof armor. Well that tank is awesome. Only downside is 20km/h. And everyone can pen the lower plate, side and rear of it. But I dont enjoy playing it, because I generally dont like slow tanks. The the tech tree tank is OP and the premium is balanced, Mauerbrecker is more what a balanced super heavy should look like, there are probably some issues (not sure it needs the MG weakspot or the weird inside the track weakspot) but the Japanese heavies, Vk 1001 P, Maus etc. should be more balanced like the Mauerbrecker IMO. It's not balanced, it's bad. But if every bad tank is balanced, then it's balanced. Well the question is if they learned their lesson or simply see no need to pander to EU player base. Until proven otherwise, I believe its the later. You are aware that premium tanks werent better for majority of WOT's lifespan, right? and that WOT built its empire on that model? The exp and cash benefits + crew training and pref MM were more than enough to sell enough prems for WG to go multibillion company. Edited by malowany, 04 March 2019 - 05:23 PM. You're right, it's not the greatest premium. So why buy it, and why play it? Edited by Hechaton, 04 March 2019 - 04:45 PM. For credits, because they look cool, because they are different from all tech tree tanks (cdc). People have bought many many tanks that where worse then tech tree tanks. Just look at the amount of Revalorise, CDC, Patton KR, T54 mod.1, Tog II, any T5 premium, Panther 8.8, T34, Jgtig 8.8, KV-5, Super Pershing, T-34-3, WZ-111, 112, FV4202, IS-3A (first iteration), Mauerbrecher, FCM 50t, Black Dog, Type 64, Type 62, T-34-85M etc. All of these have been bought when they where inferior to the tech tree tanks. The T-34-85M have since gotten buffed to be better then tech tree tank. A few could have been gotten through marathons.